The low-cost MEMS group focuses on developing non-conventional microtechnologies, that are not dependant on high quality cleanrooms. 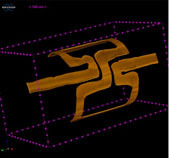 Inkjet Printing and pre-stressed substrates (Rolled-up MEMS) are the main toolboxes used. The thereby fabricated devices have their main advantages with respect to obtainable shapes and (flexible) substrates available. On the other hand they can naturally not compete with the high quality of standards cleanroom MEMS devices. To compensate that drawback, we also develop embedded electronic that digitally compensates, for example, the fairly big variations among the components. By combining these technologies one application we aim for is in the field of extreme point of care settings, where the low price of the parts is important. In addition for this application the integrated electronic is also very important for automated readout and maintenance/calibration of the devices without highly trained personal. 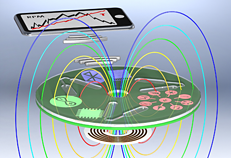 The combination of these efforts can be found in an electrified version of the known Lab-on-a-Disc platform with integrated sensors and actuators. But our devices also contribute to research question in developed world settings, for example, in the form of cylindrical micro-coils for magnetic resonance microscopy.